Prayers have been said in the McCanns' home village, two years since their daughter Madeleine went missing. Gerry and Kate McCann are thought to be spending a weekend away from the spotlight while churches in Rothley, Leicestershire marked the anniversary. Private detectives have spoken publicly about their inquiry for the first time. The British former police officers said the answer still lay with someone in the Portuguese resort from which Madeleine disappeared, aged three. Ahead of the anniversary the family released an age-progression image of how Madeleine - who vanished from the family's holiday apartment in Praia da Luz - may look now at nearly six years old. 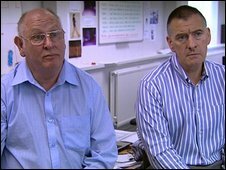 Detectives Dave Edgar and Arthur Cowley told a Channel 4 documentary, to be aired next week, that someone living in or around the Algarve resort knew what had happened to her. Mr Edgar, a retired detective inspector with 30 years experience, said: "You don't start an investigation in Morocco or Spain or France or even Lisbon. "This offence happened in Praia da Luz. It is a very self-contained resort, and that's where we've started and that's where I think the answer is." The detectives disclosed that a witness statement released last summer corroborated the sighting by a friend of Madeleine's parents of a man carrying a girl in the area at the time she went missing. They also said statements from files released last summer suggested the family may have been watched in the days before Madeleine disappeared. Cutting Edge: Madeleine Was Here follows the two men as they try to piece together eye-witnesses accounts. In Rothley, Rev Rob Gladstone from the parish church said prayers were held every week for Madeleine but there was extra thought on the anniversary. He said there was no special service as the anniversary tied in with normal Sunday services. Father Keith Tomlinson, priest at Rothley's Catholic church Sacred Heart, said mass was dedicated to the McCanns. 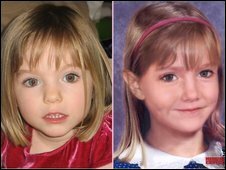 In a statement issued ahead of the anniversary, the McCanns said: "The pain and anxiety does not lessen, but our determination to find our beautiful daughter remains steadfast. "We are no longer looking for a four-year-old little girl - but a six-year-old one. This is crucial. "We are hoping that the new, age-progressed image of Madeleine aged six, produced by the National Center for Missing and Exploited Children in Washington, will help people to see what Madeleine may look like today." Despite numerous leads, the investigation into what happened to her has drawn a blank.